Anglers can save significant money by purchasing their fly rod in a combination package that includes not just the rod, but also the fly reel, the fly line, backing and either a rod tube or rod sock. These packages are interchangeably called "fly fishing combos" or "fly rod outfits." 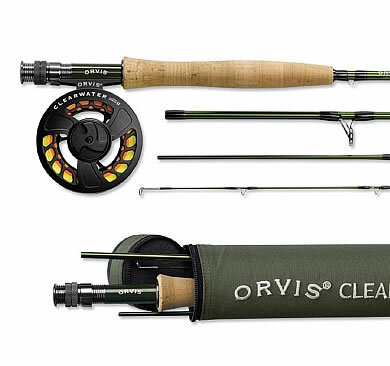 An Orvis Clearwater Fly Rod Combo, which is an excellent combo package for beginner anglers. More Info at Amazon. Once upon a time, most fly fishing combos contained gear that was, to put it politely, not of the "best quality." In the bad old days, the fly rods that were part of the fly fishing combo were generally made of fiberglass, contained terrible fly line, and a fly reel that was likely to fall apart the minute an angler tagged into a big fish. But times have changed. Today, outside of the combos sold at the big box stores, most fly fishing combos now contain a quality rod, reel and line. While "junky" combos still exist, some of which work ok for kids to chase panfish at the local pond, anglers now have an excellent selection of combos and fly fishing outfits to choose from. Of course, with that large selection of fly fishing combos to choose from, another problem presents itself. That problem is....what to get? And, just as importantly, making sure that buyers remorse doesn't set in a season after buying the combo package. And that is where this guide to fly fishing combos comes in. The goal of this article is to introduce anglers to what a fly fishing combo is, explain their benefits and drawbacks, and to help anglers choose the right combo for their particular fishing needs. Also, while beginner anglers still purchase the majority of fly fishing combination packages, combos aren't just for beginners. Intermediate and even expert anglers can now find combo packages that are well-suited for their fly fishing needs. What Is a Fly Fishing Combo? How to Select a Fly Rod - A related and helpful article, which also will help anglers in choosing the right fly fishing combo for their needs. Before diving further into the world of fly fishing combos (also known as fly rod outfits), let's start at the beginning and describe exactly what a combo for fly fishing is. Many of these "other items" are handy to have, for sure. And sooner or later, anglers will want to purchase many or most of these "other items." However, none are strictly required to "make a cast" when fly fishing. Moreover, all these other items are easily bought, frequently personalized in various ways and are generally relatively inexpensive. Cost Savings - Buying individual pieces is expensive. A rough rule of thumb is that a combo/outfit package will save about 10-20% off the cost of buying the components separately. And sometimes, the savings will be even more. Convenience - When purchasing a fly fishing combo, the fly reel arrives with the fly line backing and fly line already spooled on the reel. Thus, an angler won't have to try to do it themselves or hunt around for a fly shop to do it for them. Everything Matches - For beginner anglers, this in my opinion is the most important benefit of buying a combo package. A combo package will always contain a properly matched fly rod, fly reel and fly line. Or, to put it another way, the fly rod and fly reel will match up properly with the fly line weight that comes with the package. If this concept of fly line weight makes no sense to you, please read the article How to Buy a Fly Rod as well as the Fly Line Guide to understand the critical importance of fly line weight. Well Balanced - With most fly fishing combos, manufacturers now make sure that when an angler holds the fly rod, everything seems "well-balanced." This means that when an angler holds the fly rod parallel to the ground, the rod isn't threatening to tip forward or backward due to the fly reel being too heavy or too light. That said, about the only real reason I can see why a new or intermediate angler might want to purchase individual components is if they already have and like "some of the items" that are included in a combo package (in particular, the fly rod). Many of the features I suggest anglers look for when buying a fly fishing combo are the same for when buying a fly rod or fly reel individually. If you want more details about buying individual fly rods or fly reels, read the Fly Rod Guide or the Fly Reel Guide. For new anglers, get a package that contains a medium-action fly rod. They are the most versatile of fly rods and are pretty forgiving to learn on. If you want to know more about fly rod action, read the How to Select a Fly Rod Guide. Rod length, for trout fishing, should be 8.5 to 9 feet in length. Beginners will not want to go any longer, and only should go shorter if the majority of their fishing will be for smaller fish, such as panfish. The weight of the fly rod (which means what weight fly line you plan on using) will vary depending on what you fish for. But for trout fishing, generally a 4-weight, 5-weight or 6-weight rod is best. I personally prefer a 4-weight, but that's just me. A 5-weight rod is probably the most versatile, though. New anglers don't need a $700 package (although they are certainly nice to have). However, cheap combo packages perform poorly and will quickly prove frustrating to new anglers. Beginners should look at packages in the "mid-range" in terms of price. I personally think the $250 to $400 range is the "sweet spot." At this price range, the angler will get a fly rod and fly reel they will not quickly outgrow and, more importantly, will enjoy using until the day comes to upgrade. For new anglers, one excellent choice is the Orvis Clearwater Fly Rod Combo Package that is available. But countless quality combos are available at Cabela's, local fly shops and on Amazon (just watch out for junky combos on Amazon). Here's some good brands of fly fishing combos : Cabela's, Orvis, Sage, G. Loomis, Winston, Redington, Fenwick, Scott & St. Croix. By and large, anglers who purchase equipment made by one of these companies will have few complaints and likely will not quickly outgrow the components. The above list is by no means exhaustive. Many other fine fly rods are made and put into combo packages. These are just the ones I'm familiar with. Plan to travel frequently? If so, consider getting a fly rod that packs into 4 or more pieces - they are far easier to travel with. These rods are frequently called "Travel Rods", appropriately enough, and are usually sold in special "Fly Fishing Travel Rod Combo Packages." There is an almost bewildering variety of fly rods available today. So perhaps it should come as no surprise that there are a dizzying amount of fly rod combos available, too. To hep new anglers find what they need while avoiding buyers remorse, here's some additional shopping suggestions to compliment what was discussed above. First, ignore anything for less than $100. It's junk. While those ultra-cheap packages might work ok for the kids to fish for panfish at the local pond, don't even think about chasing trout with them in trout-infested waters. Secondly, while some decent packages are priced in the $150 to $200 range, I personally think the "sweet spot" for package price is in the $250 - $400 range. It is at this range where the angler gets a very good quality fly rod, reel and line. And because the quality is good, the angler will not quickly outgrow (and may never outgrow, actually) the components. Try to get a combo package that contains a rod tube, not just a rod sleeve. A rod tube is vital to protect the fly rod from breaking. If you plan to fish for trout, look for a combo package that contains floating fly line with a weight of 4, 5, or 6. For more information about fly line weight, please read the Fly Line Guide. Don't buy a combo package because it contains all those "other items." Sometimes those packages that contain all the "other stuff" is a great value. However, often times these packages contain lower quality rods and reels to "make up" for all the other stuff that is included. It is far better to get a good rod/reel/line package and buy the other things separately. Don't worry about the flies. Many combo packages contain flies and fly boxes. When shopping for a package, my suggestion is to "ignore them." Most likely, the flies will only be partially useful for your fishing needs. Anglers are almost always better off buying flies separately to meet their needs. Similarly, ignore the leaders and tippets that come with packages. Once again, leaders and tippets are a "personal thing" that is customized to meet an anglers fishing needs. Usually, combo packages will toss in a lot of leaders/tippets that the angler never uses. Also ignore any clothing (such as a fishing vest) that is part of the package. Usually the vests that are part of packages "aren't the best." Moreover, a vest - being clothing - is a personal thing and is best bought separately. In short, when buying a combo package focus on what fly rod, what fly reel and what fly line is included. Ignore everything else. If you find a quality fly rod, fly reel and fly line in a combo package you like that contains "other stuff" for very little price difference, then by all means get it. But don't be blinded by all the "other things" in a fly fishing combo/outfit package. At the end of the day, all the counts is that the angler purchases a good fly rod, a good fly reel and a good fly line - all properly matched and well-balanced. All the other stuff is "just gravy." If you are a new angler and want a suggestion, The Orvis Clearwater Fly Rod Combo is ideal for beginners. Beginners will be in no rush to upgrade from this combo (I still have mine and use it often). Other good combos for beginners and intermediate anglers are available from Cabela's, Sage, and G. Loomis. Offline, local fly shops do sell combo packages. However, selection is often limited unless you buy directly at an Orvis or Cabela's retail store. Big box stores such as K-Mart also sell fly fishing outfits and combination packages. However, virtually all of them are junk and best ignored. Orvis Clearwater Fly Rod Outfit at Amazon - The Clearwater Series fly rod is an excellent beginner-intermediate fly rod. Moreover, the rod in this outfit comes with a 25 year warranty. Anglers will not soon outgrow this outfit and is a great one to buy if you're unsure what to get. Fly Rod Combos at FishWest - Fishwest has a great selection of ready to go fly rod outfits available. Cabela's - Cabela's sells almost too many fly fishing combo packages. Literally, they have 100's available. With the exception of a few junky ones that are priced around $150 or less, virtually all of them are of good to excellent quality. Moreover, Cabela's also sells very high-end fly fishing combo packages. These high-end packages contain top-shelf rods, reels and line. They aren't inexpensive, but for anglers who want to get high-end gear right out of the gate, Cabela's is a fine place to shop. The Rivers Edge - A respected Bozeman fly shop which has an excellent online store. Sells Sage, Winston & Scott rods and fly fishing outfits. Front Range Angler - Sells high quality fly rods. A Colorado fly shop that happens to have an online store, too. Telluride Angler - Another Colorado fly shop with an online store.